The cities of Erlangen and Nuremberg are located in the district of Middle Franconia in the Free State of Bavaria. Nuremberg can be reached by train from Frankfurt in 2,5 hours, from Munich in 1,5 hours and from Berlin orHannover in 4 to 5 hours. For further information on trains see the homepage of the Deutsche Bahn. From the main train station of Nuremberg take the subway line U2 (direction airport), U21 (direction Ziegelstein) or the line U3 (direction Maxfeld). Exit after an estimated time of travel of 3 minutes at the station named “Rathenauplatz”. 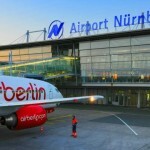 A number of national and international airlines fly into Nuremberg Airport. 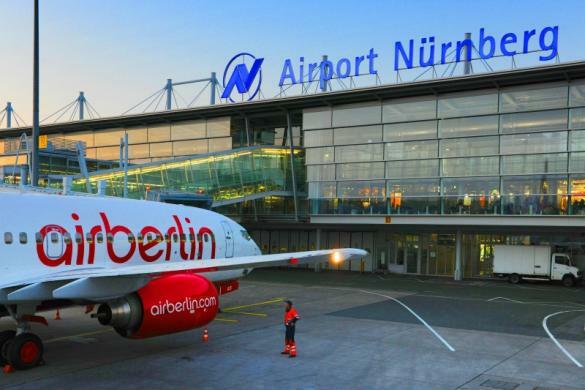 Most European Cities can be reached directly from the Airport or via transfer hubs such as Frankfurt, Munich, Paris or Amsterdam. Take the subway line U2 and exit at the station “Rathenauplatz” after a travel time of roughly 9 minutes. The WiSo – School of Business and Economics is situated in two locations: the facility in the Lange Gasse, the main building of the WiSo, houses for example all the departments (chairs) and most of the lecture rooms. The building in the Findelgasse houses the Dean’s Office, the Student Records Office and some lecture rooms and other facilities. Exit the subway station “Rathenauplatz“ using the moving stairs to the north. 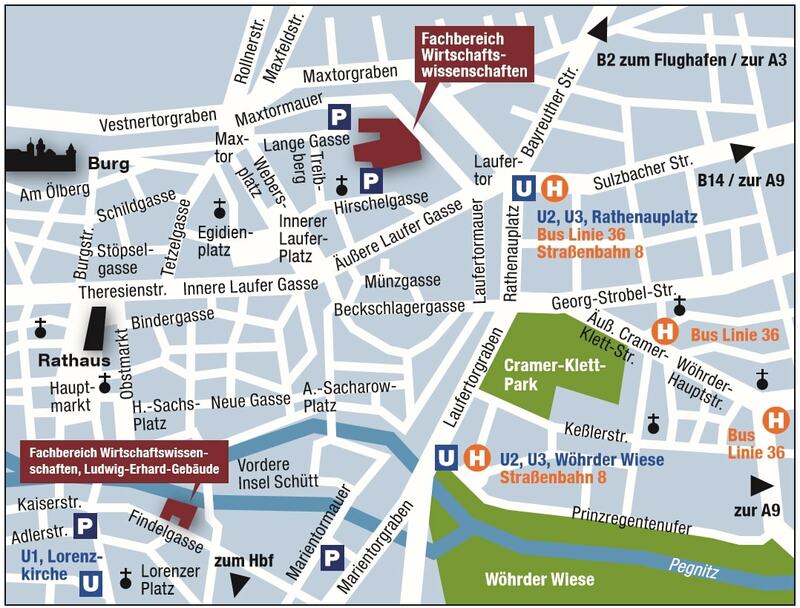 Then turn to the left (west – direction “Äußere Laufer Gasse“), then take the way to “Hirschelgasse” (turn right – past the bakery) which leads off the “Äußere Laufer Gasse“ slightly uphill and then take a left till you reached the entrance of the subway. After roughly 150 Meters you will reach the entrance to the underground parking garage. Continuing past the garage and the neighbouring church you will reach the steps leading to the entrance of the building via a narrow footpath on the right hand side. From the main train station take the subway line U1 (direction “Fürth”). Exit at the “Lorenzer Platz” station and walk towards the main market square. On reaching the bridge leading over the river Pegnitz turn right into the Königstorpassage and continue along the river front to the FG. 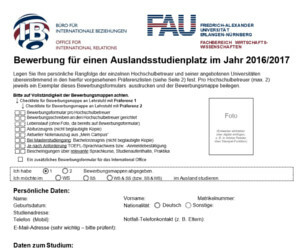 The courses take place in Lange Gasse 20 and in Findelgasse 7-9 inNuremberg.